Salem played the Piteå Dansar och Ler festival on Friday night. Found a couple of new interviews with Salem: one at Norrbottens-Kuriren: http://www.kuriren.nu/noje/artikel.aspx?articleid=5478318 - in which, among other things, Salem states that he likes to mix big and small gigs but prefers playing smaller gigs; he comments again about dealing with the extra attention and trying to keep his public life separate from his private life, whilst acknowledging that this period of attention may not last and could all be over by next year. In this interview he also highlights that if his lyrics become too personal, then it can be difficult to perform the songs live without being emotionally affected. (There is one particular song, which Salem refers to but does not wish to mention in the interview). The other interview, at PT Noje: http://www.ptnoje.se/Article.aspx?a=5504498 mentions performing for Crown Princess Victoria, his delight at his second place and not winning Melodifestivalen, and how we'll have to wait a while for any new material as he's going to take a (very well-deserved) rest following his big summer tour. As for reviews, I've just found this at Norrbottens-Kuriren: http://www.kuriren.nu/nyheter/artikel.aspx?articleid=5479194 - it's a reasonably positive review ("...I believe in him because he convinces me with his joy") but the reviewer also suggested that there was a 20 minute period in the set which wasn't so good (?) before the euphoria was revived again towards the end of the concert. "Ignore This" has climbed back up the Sverige Topplistan album chart to no. 15, whilst "4 O'Clock" is a re-entry at no. 53 and "Keep On Walking" is a re-entry at no. 56 in the singles chart. It definitely proves the promotional power of a TV appearance! Hope we see Salem on TV again soon. Found this! According to the Jönköpings Konserthus official website, Salem will be appearing there with the Jönköpings Sinfonietta next January. Tickets don't appear to be on sale yet though, but once I get more information I'll let you all know. Maybe more shows to come? Does anyone have any more info?? It's a bit of a quiet time on the news front, so I thought I'd just remind you that Salem will be playing the KAOS festival in Mellerud this coming Saturday. He will be on the main stage between 19:15 and 20:15. More information about the festival and all the acts appearing there, at www.kulturkaos.se. Today the total of Salem fans on Facebook reached 43,000.....it's only a matter of time till it reaches the magic 50,000! I still don't know how many of the Facebook-fans are aware of the existence of Planet Salem, so I'd really appreciate it if someone could maybe give this blog another mention on the Facebook wall (Eva....I know you previously did this, but if you or someone else could do this again, especially as there are more and more fans there!). The reason is that I would like this blog to reach as wide an audience as possible so that we can all keep spreading the word about Salem's brilliant music, and keep building the international fanbase. Planet Salem already has a very dedicated readership and I just want it to grow and grow. And one more thing...if you watch the interview I think you will all agree that Salem looks extremt snygg just nu.... Looks and musical talent: he has it all. Salem's summer tour now takes a break for a few days: next stop Piteå Dansar och Ler next Friday: http://www.pdol.se/program/stora-scenen/salem-al-fakir/ - Salem will be on Stora Scenen in the northern Swedish city next Friday night at 20:45. Hope you have a good break over the next few days Salem....you deserve it!! "Ignore This" is at no. 29 in this week's Sverige Topplistan album chart. In this article in Aftonbladet today, http://www.aftonbladet.se/nojesbladet/article7499129.ab Salem said that he was very satisfied with his second place in this year's Melodifestivalen, which he described as "absolutely fantastic" and had won many new fans as a result. There's a very good review (by Magnus Johansson) of Salem's Sunday night gig in Falkenberg at http://hn.se/nojekultur/musik/1.898206-salem-al-fakir-sprider-gladje-fran-scenen and some very nice pictures there too. I particularly liked the reviewer's comparison/description of Salem as being like "the young school teacher who became the most popular because of his charm and humour rather than his authority". I loved SVT's close-up shots of Salem on "Keep On Walking", when the wind was blowing through his hair and the way the light was shining behind him...hope these pictures are ok, although it was harder to take pictures during "4 O'Clock" as the great man just can't keep still for a second! (but then when we listen to it, we can't keep still either). If you are going...enjoy the show! Salem on Allsång = fabulous. I've just finished watching tonight's "Allsång på Skansen" and the extra Webballsången. "4 O'Clock" to start the show, "Keep On Walking" to end the show (with Salem jumping off his piano stool! ), and "I'm So Happy" in the extra-show. He certainly knows how to make a crowd happy too. Salem's band were also great tonight - and I really enjoyed that guitar solo from Adam on "I'm So Happy". If you haven't seen this week's show, or you just want to watch it over and over again like I do, go to http://svtplay.se/t/102897/allsang_pa_skansen - Salem appears 5 minutes into the show ("4 O'Clock") and at 54 minutes ("Keep On Walking"). Found a nice review of last night's show at http://www.aftonkuriren.se/?p=11947 with a good picture of Salem. Were any Planet Salem readers at Skansen? Allsång på Skansen right now!! Anyway he was brilliant as always, a complete showman and entertainer. And of course he looked very nice in his dark blue suit and new glasses! He'll be back again later in the show - I'm hyperventilating with excitement!! Salem i mitt hjärta - Allsång tomorrow! Don't forget to tune into SVT1 at 20:00 tomorrow night for this summer's most long-awaited edition of Allsång på Skansen! Salem and Oskar Linnros will be appearing on the show. Of course this brings back memories for me of Salem's first appearance on Allsång in July 2007, one of the first times I ever saw him on Swedish TV. This is one of my favourite clips ever, it's a brilliant performance of my favourite Salem song, and I thought I'd share it here once again for everyone who hasn't seen it....and of course for everyone who loves it as much as I do!! And follow the lead-up to the big show at http://svt.se/2.37615/ which includes a little video interview with Salem, which was recorded at the show's launch a few weeks ago. I've just read on Facebook that Salem went on with the show in Falkenberg last night despite being sick. 40,000 - the magic number! Today the number of Salem fans on his Facebook fan page reached the grand total of 40,000. I just thought I'd give a quick mention here that my other blog, EuropeCrazy, is back and has been relaunched after a few weeks' break. It's mainly about music (lots of Swedish music of course), TV and travel, so check it out! http://europecrazy.blogspot.com. Salem is playing a variety of venues on this extensive (and I would imagine, exhausting!) summer tour of Sweden....and on Sunday 18th/Monday 19th July he plays what could be described as the "sweetest" venue of them all! In other words, Stålboms Konditori in Falkenberg. Support on both nights comes from Jennie Abrahamson. It's an unusual and intimate venue and if you are lucky enough to have a ticket for the show, then you will be in for a treat as always. And I don't just mean the cakes :))) Enjoy the show! Södermanlands Nyheter has a review of Salem's show at Skeppsbron 11 in Nyköping on Thursday. It's an extremely positive review by Olle Söderström, in which he makes the point that Salem's music sounds as good in a small, packed, sweaty club as in a more formal concert hall. In the reviewer's words: Salem fits everywhere. Another new remix of "Keep On Walking"
After 18 weeks on the Sverige Topplistan album chart, "Ignore This" stays at no. 27 this week. I'm sure the album will climb the charts again after Salem appears on Allsång next Tuesday! Meanwhile "Keep On Walking" is climbing the Swedish airplay charts once again. The song has of course been one of the most played songs on Swedish radio since March 2010 and this week has climbed back up to no.5 (from last week's no.6) in the Nielsen Music Control Airplay Chart. The programme for this year's Malmöfestivalen has now been revealed. Salem will be performing at Stora Scenen, Stortorget on Thursday 26th August between 21:30 - 23:00. There is a very interesting interview (in Norwegian) with Salem at http://www.side2.no/underholdning/article2946158.ece which focuses on the remarks made in the Swedish media (just prior to Melodifestivalen) by Salem's violin teacher Michail Kazinik, when he criticised Salem for turning his back on classical music - "we got a pop artist for the price of a genius". In this new interview Salem says he can't understand why Mr Kazinik made these comments...and that the attitudes within the classical music world are wrong: "Music is for everyone and no one should be able to say what's good or bad music"..."it is up to the individual listener to decide if he or she likes music". (My comments: Salem's all-inclusive attitude to music is well-documented in many interviews which he has done....and I think that's what makes his own music so diverse and special). Skeppsbron 11 in Nyköping will be the latest stop on Salem's summer tour on Thursday 15th July. If you're going, enjoy the show and as usual you can leave your comments, reviews, blog/video links etc here. Three years of being a Salem fan! But what's your fan-story? When was the moment you became a Salem fan? Were you a fan from the beginning of his career, or after Melodifestivalen? Did you discover his music by accident, like I did? I'd love to hear from you if you have a particular story to tell about how you discovered Salem's music, and what makes him so special to you. Salem was one of the acts appearing in the show, which took place in Halden, in front of an audience of 8000 people. He sang "Keep On Walking" on the show, which will be broadcast on Norway's TV2 tomorrow night, 15th July, at 20:00. There's a very good new interview with Salem in the Mitt i.... publication which has different local editions for the greater Stockholm area. 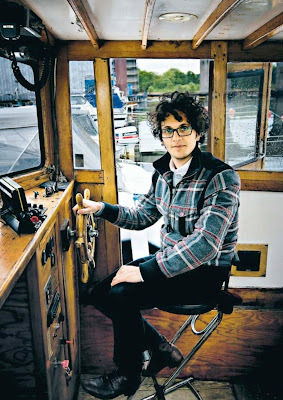 The good news is that this week's copy is also available on the internet at http://www.mitti.se/ so get along there quickly, choose a local area and follow the link to Salem's interview (page 14/15). Salem will be appearing on NRK1 TV's "Sommeråpent" tonight. The programme starts at 21:30. I've been looking all over the internet and haven't been able to find any reviews or articles about Salem's gig in Borgholm last Friday. Were any of you at the Strand Hotell? I'd love to hear what you thought of the show. I know that this has been around YouTube for a while, but I thought I'd mention it if you hadn't seen it yet....a medley of Salem songs ("Keep On Walking"/"It's True"/"Astronaut"/"Roxy") with very humorous Russian-themed lyrics, sung in the style of the Red Army Choir! "Ignore This" is at no. 27 in today's Sverige Topplistan albums chart. Tomorrow night Salem and the band will be at the Strand Hotell in Borgholm. According to the hotel's official site http://www.sommarstrand.se/se/Kalender/2010-07-09 Salem will be on stage at 23:00. Salem was only expecting a few hundred people to turn up for his concert last night in Ö-vik..but he got 7000 people instead!! If you were at the show remember to leave your comments here! Even my iPod knows who I want to listen to! Track 1 - "One Of The Others". Track 2 - "Twelve Fingers". Track 3 - "It's True". Track 4 - "Inga Problem" (Snook, which Salem featured on). As Popjustice is one of this country's most high-profile music blogs, this will introduce the song, the band and of course the remixer to a whole new audience :) Popjustice is very supportive of Swedish music and I'm sure they will support Salem whenever his music is finally released over here. On Thursday night Salem and the band will be in Umeå, Norrland's biggest city, where they will top the bill in this week's "Sommaren i City" concert. It's certainly a very diverse line-up tomorrow night, with rock band Sweet Seed on stage at 18:30, then dansband Max Fenders at 19:00, jazz pianist Birgit Lindberg at 20:00 and finally, at 21:00: Salem Al Fakir!! If you're going tomorrow night, enjoy the show! The Facebook fan-count continues to climb - the total of fans on Salem's Facebook fan page reached 38,000 tonight. 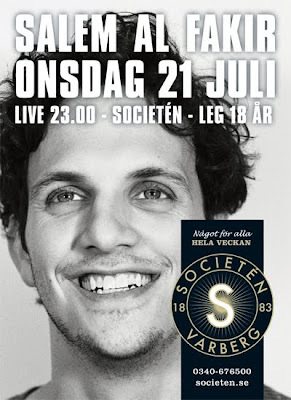 Get along to Strandparken tomorrow night! The show starts of course at 7 o'clock (in the evening) - sorry I couldn't resist that little joke! - it should be an amazing show and best of all, it's free - so maybe Salem will win even more new fans! Whilst I'm on the subject of new fans, I noticed that almost 3000 new fans have joined Salem's Facebook fan page in the last 3/4 days. This is great news, isn't it! I wondered if there was any particular reason for this - or is it just that everyone is finally beginning to appreciate his brilliant musical talent? Also I thought I'd mention that Planet Salem's Swedish and international readership continues to grow, and this blog is now being read in all parts of the world. It doesn't matter where you come from, you are all very welcome as we all have one thing in common - we all love Salem! Vote for Salem in this year's Rockbjörnen! Nominations voting is open until 15th August, then the shortlisted nominations will be revealed and the final round of voting will open and will run until 25th August. The Rockbjörnen gala will take place on 1st September. Salem fan-power is at its height at the moment (over 36,300 fans on Facebook today) so rösta, rösta, rösta!! Damien remixing Fibes, Oh Fibes! "Keep On Walking" - dance remix version! If you are anything like me, then you won't let a day go by without hearing "Keep On Walking" which still sounds as fresh as it did when we all heard it back in February. But it's also good to hear the song in a completely different way. I wanted to share this with you tonight - it's a great remix of the song by Swedish dance producer Vanity In Mind which puts the song into a whole new context and turns it into a great big electronic trance club anthem. I think it's great! Have a listen and let us know what you think. Salem Al Fakir - "Keep On Walking (Vanity In Mind Remix)"
Another night and another stop on Salem's lengthy summer tour, which arrives in Enköping tonight. Salem will be on the Stora Scenen at the Enköping Gatufestivalen. I didn't know where Enköping was, so I had to check the map and found out that it is halfway between Västerås and Uppsala. If you are going, enjoy the show and of course you can post your comments here. Now over 35,000 fans on Facebook! Today Salem's Facebook fan page has reached the grand total of 35,000 fans. Go to http://www.helagotland.se/noje/artikel.aspx?articleid=6114643 where there is an interview with Salem in advance of his show in Visby tonight. "Ignore This" has dropped from no. 22 to no. 25 in this week's Sverige Topplistan album chart. Meanwhile the ever-popular "Keep On Walking" has climbed back up from no. 60 to no. 53 in the Sverige Topplistan singles chart. I think it would be fair to say that after all these weeks in the singles chart, and weeks at the top of the airplay chart and Mix Megapol Topp 20/Tracks etc..that "Keep On Walking" is the most popular song of 2010 in Sweden! Visby tomorrow: discuss it here! Salem and his band will be in Visby tomorrow for the latest stop on their summer tour and they will be playing at Wisby Strand Congress & Event. I think there are still tickets available - so if you live on the island of Gotland, then this is your opportunity to see Sweden's greatest in action!! Go to http://www.wisbystrand.se/2409 for more information about the show. I don't know if there are any Planet Salem readers living on Gotland, but if you're out there and going to Salem's concert tomorrow, remember that you can leave your comments about the show on this blog!